August is a misunderstood month. “Nothing gets done in August,” people say. “Everyone’s on vacation.” But who is everyone, and what exactly does vacation mean? Below this surface fiction of hot, languid days, college freshmen pack up and get ready to step out of the only life they’ve ever known and into a new one they can’t quite imagine yet. Young couples get married. Babies conceived on cold winter nights are born on warm summer mornings. Teachers write lesson plans. Schoolkids—well, they’re probably still in happy denial, though a few might secretly look forward to being a whole year older than last year. And some of us have books coming out, not long after Labor Day. Call me a late bloomer, because I am, but publishing my first book this fall feels in many ways just as scary as going off to college. I was an early-bloomer then. I left home for college at seventeen. And all through that long-ago August, a stranger stood in my bedroom, reminding me that I was about to step off a cliff. The stranger was a suitcase. I’d never owned one. Never needed one. But here it was, my own classic, rectangular, sky-blue Skyway, a high school graduation gift from my grandparents: quietly waiting for me to fill it. Quietly reminding me, every day, that the Skyway and I would soon be flying east into a different universe called college. A universe I longed to love but didn’t know yet if I would. Didn’t know yet that there would be moments worth loving, freedoms worth having, but crises and troughs and miseries too. 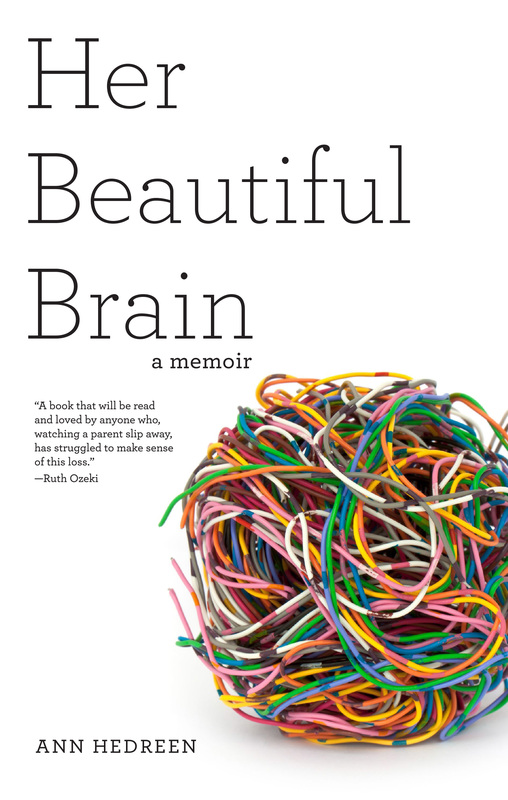 I want to love launching my first book, Her Beautiful Brain. But now I’m way beyond old enough to know there will be high and low points. There will be people who don’t like it. People I love who don’t like all of it. People whose attention I had hoped to attract, who ignore it. That sturdy, rectangular Skyway was my sidekick, my magic carpet, my ticket out of this sleepy old Here Come the Brides town. Grandma was so proud to have picked it out for my high school graduation gift. It was our color, the blue of all of our eyes, the blue that turned up in every ski sweater she ever knit. 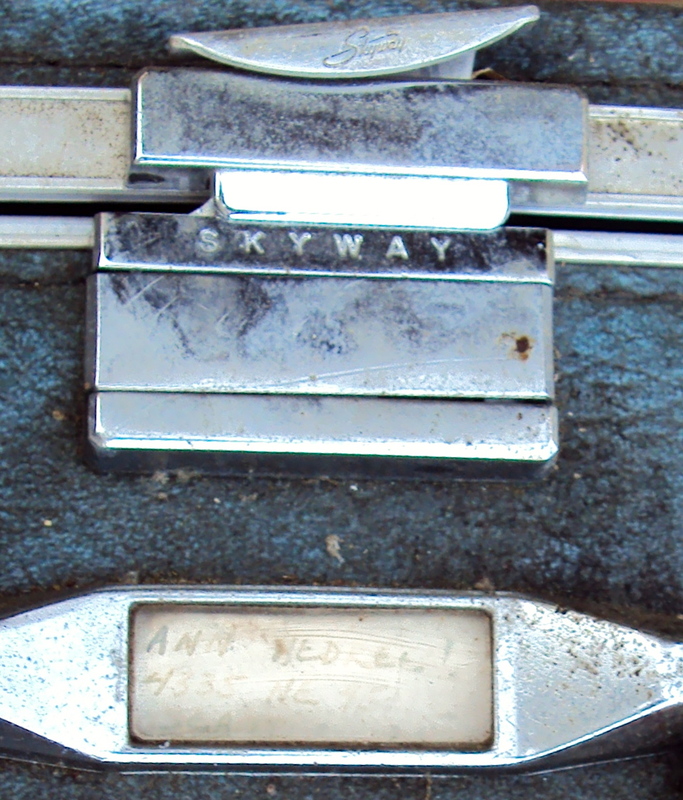 Skyway blue, set off perfectly by the stainless steel latches that snapped open and shut like a stapler. 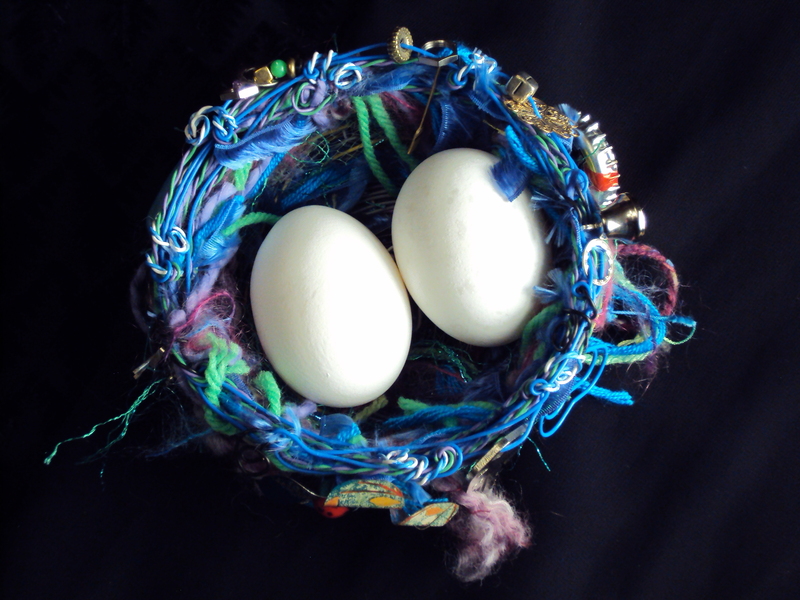 Inside, the blue was subtly quilted and had a silver sheen, not unlike Grandma’s hair. There were shirred pockets around the sides for small items. It smelled like a new car. It smelled like my life finally beginning. A few years ago, before we moved out of the house we’d been in for two decades, the time came to face the truth: twenty years in an unheated carport had not been kind to my old Skyway, so unkind it wasn’t even Goodwill-worthy. Off to the dump it went. Or “transfer station,” as we now say, as if we are gently “transferring” our cast-offs to a new habitat. As I watched the Junk-B-Gone truck pull out of the driveway, the Skyway half-buried, I felt disloyal and guilty about the haphazard way I’d stored it. It was a tool, I told myself. Like my long-gone first Royal typewriter. Or the laptop on which I started my memoir, which is not the same laptop on which I finished it. It’s where the Skyway took me that mattered. Into the stories of my life. One of which, one month from now, I will be sharing, between the covers of a book. I’ve been tagged in the My Writing Process Blog Tour by Kim Brown, editor of the wonderful Minerva Rising literary journal. Check out what Kim’s been up to at http://www.the-confident-writer.net. What am I working on?? I am working on the first draft of my second memoir. 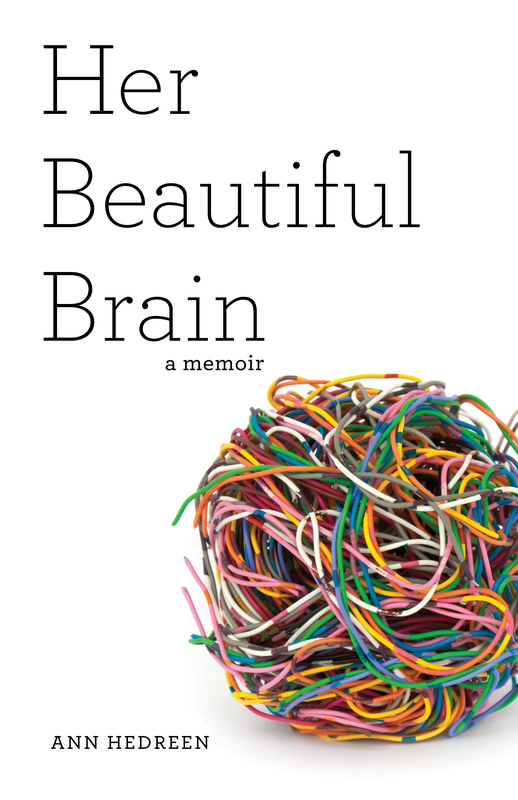 (My first, Her Beautiful Brain, will be published this September by She Writes Press.) The working title for this book is The Observant Doubter. It’s about my own checkered history of faith and doubt. Memoir is a slippery, shape-shifting sort of a genre, so this is a difficult question to answer. For me, memoir is not autobiography but more like extended essay writing, a way to explore what have become (like it or not) the enduring themes of my life. And I do mean “explore.” What I love about writing memoir are the new insights that come as you write about events in your life that you might have thought you already understood in every possible way. The memoir writers I admire include Anne Lamott, Elizabeth McCracken and Michael Klein. What I love about their work is that it asks questions. It meanders. It doesn’t follow a straight chronological line. My first book was driven by a need to honor my mother’s life and to articulate the uniquely cruel fate that is Alzheimer’s disease, an illness that is still widely misunderstood and feared even though it is poised to become the public health nightmare of the aging Boomers. My second book is driven by a desire to give voice to those of us who are neither devout, rock-solid believers or atheists. I believe there are a lot of us. I believe we are no less serious about our search for meaning than those at the outer ends of the religious spectrum. I also believe there are many of us who, like me, have had periods of more fervent faith and still feel a lot of confusion about it. 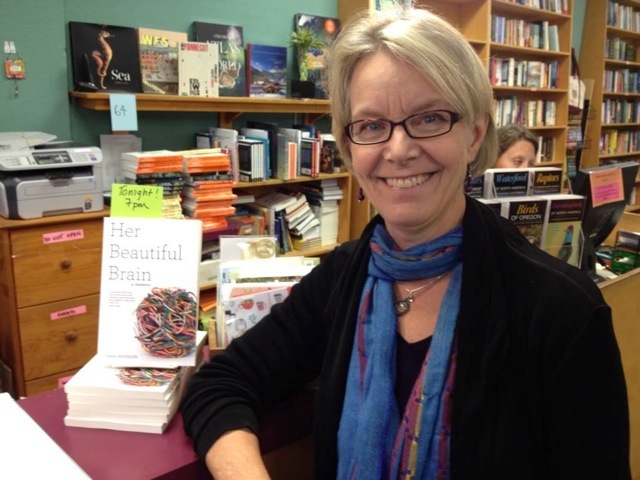 Both Her Beautiful Brain and The Observant Doubter weave personal and universal themes, which I love to do as a writer. I get a lot of practice every week writing The Restless Nest radio commentary and blog. I get up early not to write, but to read for an hour and to scribble a few pages in my journal. This sets me up for the day, which could mean sitting right down to write but more often means doing my day job (making short films for nonprofits) and slipping in an hour or two of writing when I can. I am lucky that I can do this. I work from home. I save tons of time by not having to commute. Every day is different, and I like the variety. If I have a long shooting day or a pressing deadline, that won’t be a writing day. I try to set aside longer chunks of time on the weekend. But I’m a restless person, so a long chunk for me would be three or four hours. Allison Green is the author of a novel, Half-Moon Scar (St. Martin’s). Her essays, stories, and poems have appeared in publications such as ZYZZYVA, Calyx, Bellingham Review, Willow Springs, Raven Chronicles, and Yes! Magazine. She lives and teaches writing in Seattle. Isla McKetta is the author of Polska, 1994 due out from Editions Checkpointed May 22, 2014 and co-author of Clear Out the Static in Your Attic: A Writer’s Guide for Transforming Artifacts into Art. She writes book reviews for writers at A Geography of Reading and serves on the board of Hugo House. In May, I’ll be posting an interview with Isla about her new novel on The Restless Nest. Seattle readers: On Thursday, May 1 at 7pm at Ravenna/3rd Place Books, I will be reading with fellow authors from the new anthology, Into the Storm: Journeys with Alzheimer’s. Radio/podcast lovers: This week on KBCS I rebroadcast a piece called Trilliums from April 2012. On the night the Republicans shut down the government, I was teaching at Seattle Central Community College: “Intro to Memoir Writing,” a non-credit class offered through Central’s lively Continuing Education program. While my students and I tackled the mysterious mechanics of writing about our lives, other students and other teachers labored in classrooms all around us: French, across the hall; English as a Second Language, a few doors down; history and sociology around the corner. While Congress wasted the country’s time, we devoured time hungrily and with purpose: teaching, listening, learning from each other. While House Speaker John Boehner did his best to dismantle the democratic process, we were building—in our cases, stories, built one word at a time with sweat, tears, love and hard labor. At some point earlier in their careers, surely Boehner and his colleagues must have wanted to build, rather than tear down. Maybe not: maybe the Republican party has always been dedicated to ending government as we know it. Government, as we were taught in classrooms long ago, in which bills are drafted, debated, rewritten, passed, signed and then become the law of the land. Law: not a target for blackmail and subversion, but law. It cheers me to think of all the learning going on in community college classrooms, not only on Monday, September 30, but on any given evening. Because this is where Boehner and his cohort are going down. The people the Tea Party et al fear so much—people who think, people who want to learn rather than be spoon-fed half-truths and untruths about how democracy is supposed to work—I’m here to tell you there are more of them every day. And they’re not home watching Fox News after work, they’re going to night school. What angers me is that some of those students might also be among the 800,000 federal employees who are out of a job, thanks to the selfish grandstanding of the zealots on Capitol Hill. It helps a little to know they’ll be able to get health insurance, thanks to the Affordable Care Act. Law: the Affordable Care Law. Passed by the people’s representatives, signed by the democratically elected president, upheld by the highest court in the land. Just as I love teaching in a continuing education program at a community college: where people are excited about opening their brains up to new ideas, rather than pretending new ideas—or new laws—don’t exist. Late-season blackberries are like the denizens of a well-worn tavern: this one’s dry as an old raisin, that one’s pretty but dusted with mold; this one is big but refuses to mature, that one is sweet but too soft, turning to jam in your hand. Picking blackberries after Labor Day is indeed labor. And yet I find it compulsively absorbing. 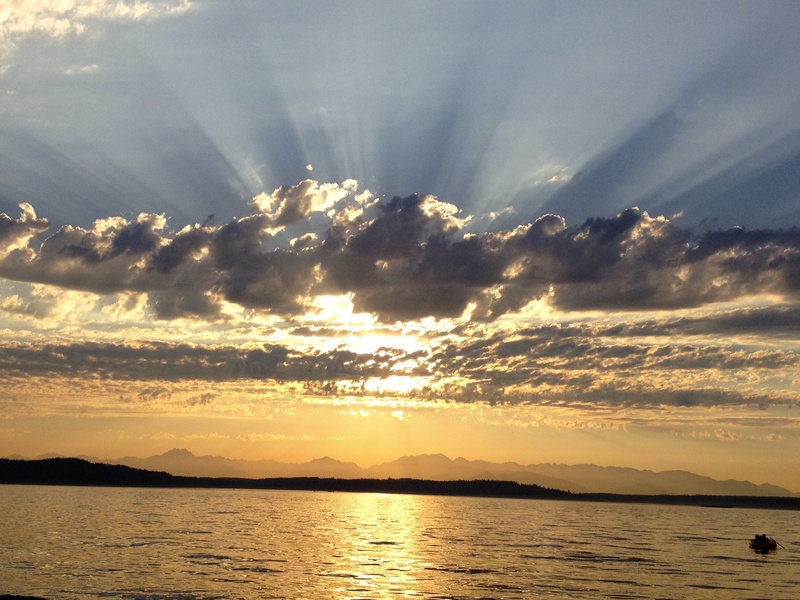 I wade in the shallows at the edge of Lake Washington, scanning, searching, occasionally finding. 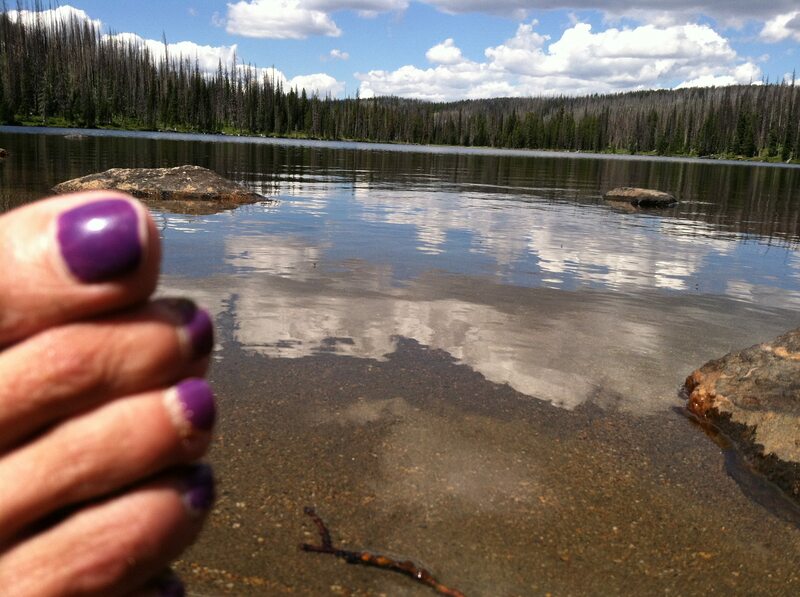 I work my way along the shoreline, a plastic bag in my sticky purple hand, my water sandals nested in mud. The sun is hot on my back. I’m concentrating so hard you’d think I was taking the Blackberry SATs. 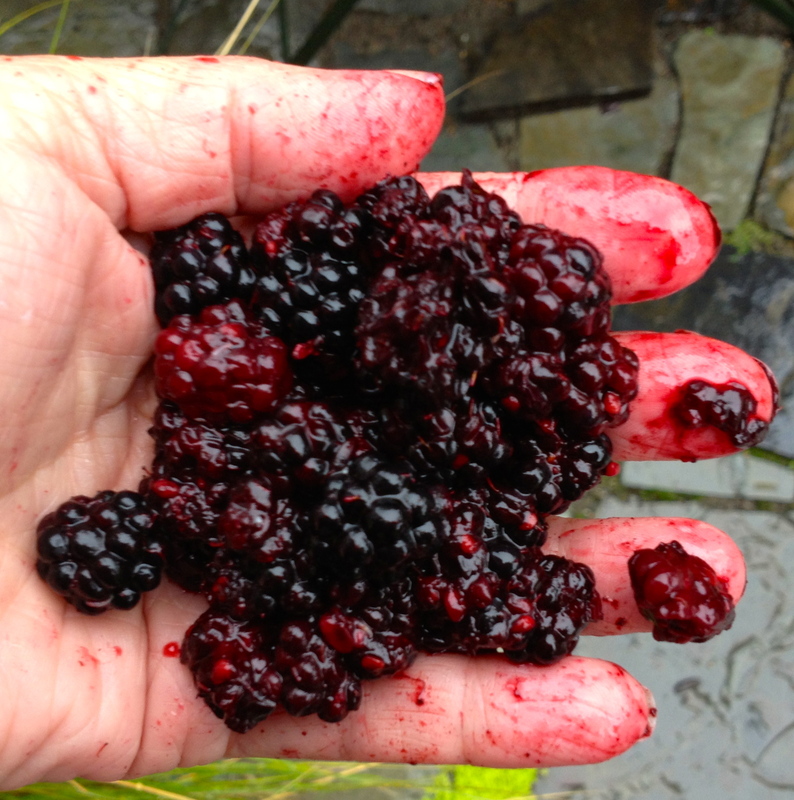 Often, I go berry picking with the goal of Thinking about something that needs thinking about: for example, should I let go of the dream of a traditional publisher for my memoir and try a different route? Or, on a more immediate note, how soon can I text my son, who is 3,000 miles away and in the throes of mono, and ask him if he’s feeling any better today? But when I step into the water and begin my hunt for the plumpest, darkest berries, I stop thinking. I go into a sort of trance state in which the only thing that matters is: where’s the next one? Is it there, on that cluster? No: they look ready, but they’re not. Or there, on the next branch? No: those ones should have been picked last week. Mold has crept over them, like a white shadow. I taste as I go: one is vinegar, one’s wine, one’s raisiny. One out of ten, aahh!—is meltingly sweet. It would have been thrilling to be a published author in my twenties, or thirties, or forties. But I wasn’t. I did other things: wrote news stories, made documentary films, raised children. Now, I’m ripening as a writer and trying hard to do it right: Study. Practice. Water and sun when I need it. Well-nourished roots. Space to stretch and put out green leaves, flowers and, finally, fruit. Which will need to picked at the right time and prepared and consumed in the best way: simply raw? Baked in a pie? Cooked into a jam? When I was about 12, my grandparents bought a beach house near Bremerton—an unglamorous but perfect spot, just a few miles from the ferry dock. To get to it, we drove to the end of a city street and then down a long dirt road through a forested ravine loaded with blackberries. When we stayed there for the first time with my mom, she was newly divorced and this was a new experience: not only because it was just us kids and her, but because we had rarely in our lives gone to stay anywhere overnight with our parents. Mom was a Montana girl who knew more about woods than she did about beaches. 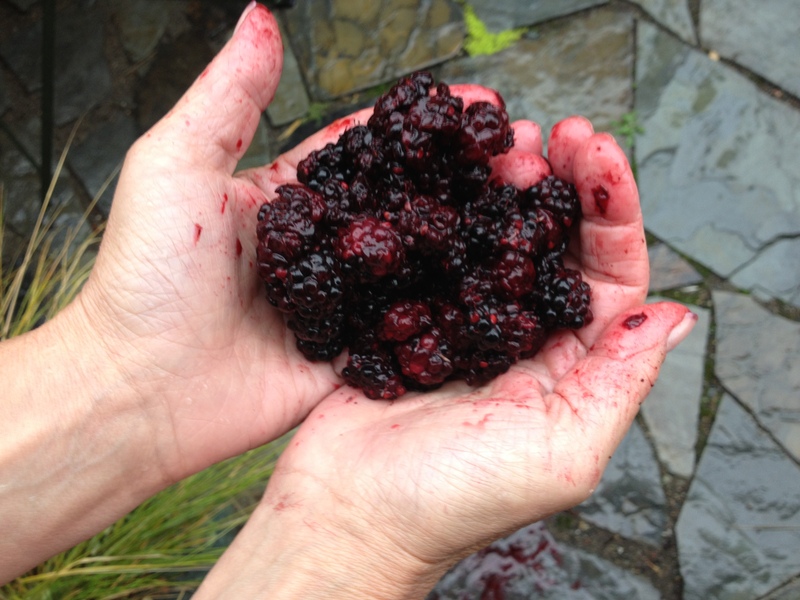 She breathed in, deeply, joyfully, at the sight and smell of the ripe berries. She urged us to pick as many as we could, promising pies and cobblers and jars of jam. Jam! We were skeptical. Night after night, our mother cranked out dinner for six children, but she had never done anything as homespun as make jam. We came home that afternoon with buckets of berries, the memory of which makes the tiny bags I pick these days look even tinier and more pathetic. Mom had been to the store. The kitchen counters were covered with jars, lids, paraffin and sugar. Her face flushed as she leaned over a pot of boiling water, fishing the jars out with barbecue tongs, explaining that she was “sterilizing” them. She looked younger than she had in months, almost childlike. Yet, oddly, she seemed to know what she was doing. We didn’t. It was the age of Smucker’s and Welch’s. Even mothers who weren’t divorced and back in college, like our mom, did not make jam, at least not any I knew. And she was right: homemade blackberry jam tasted nothing like what we bought at the store. It tasted like summer. It tasted like sun and rain and the woods and the beach. I haven’t made jam as an adult. I consider it a failing, that I didn’t do it when my own children were young. But at least I can call myself a late-blooming berry picker, one who specializes in finding the late-ripening fruit: the September berries. And I won’t give that up. And I won’t give up trying to be one myself: a late ripener. It’s a way to honor my mother, whose mid-life ripening was thwarted, eventually, by younger-onset Alzheimer’s disease. After my mother got her mid-life college degree, she became a teacher. In one of her school yearbooks, the teachers all had favorite quotes under their photos. She chose the last two lines of Andrew Marvell’s “To His Coy Mistress:” Thus, though we cannot make our sun/Stand still, yet we will make him run. I’m taking notes, Mom. Taking notes and picking berries. Ready to do some writing? Registration is now open for my Intro to Memoir class at Seattle Central. Noncredit, no stress. Five Monday evenings, starting Sept 23. More info here. Radio lovers: stay tuned! Back on the air in October. I grew up in a world of well-marked borders between work and the rest of life. Work was something my father did in an office downtown, not ever at home. I knew he was an “insurance agent” but I didn’t know, or really care, what that meant. Work was what he did to earn money. That’s all work meant. When my parents divorced, the Mad Men lifestyle they had modeled for us ended, at least at our house, for good. 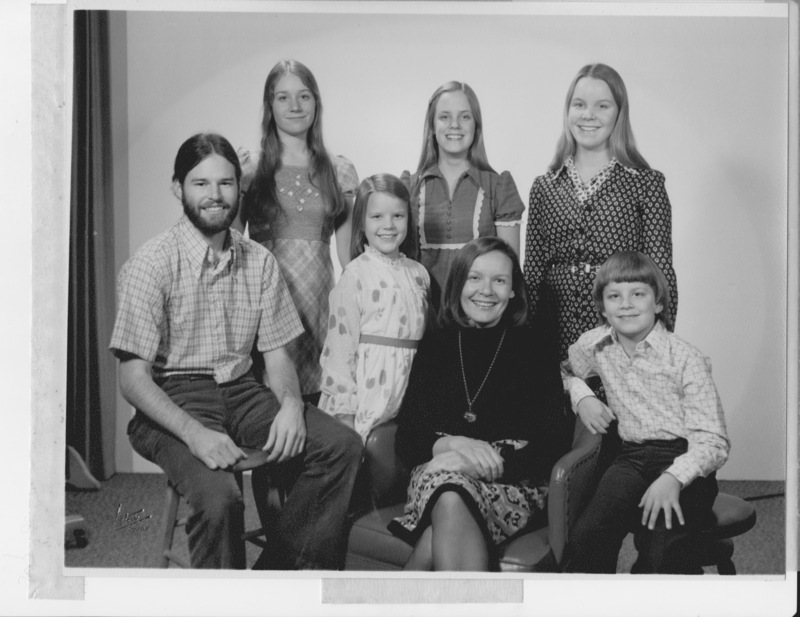 My mother went back to college and became a teacher, daily demonstrating to her six children how thoroughly work and the rest of life could and did mix when necessary. Her evenings were filled with making dinner, grading papers, paying bills, grading more papers. But still I thought of work as what you did to earn money. These days, I’m not sure what to think. I do plenty of work that is important to me for which I don’t get paid. I write these radio commentaries. 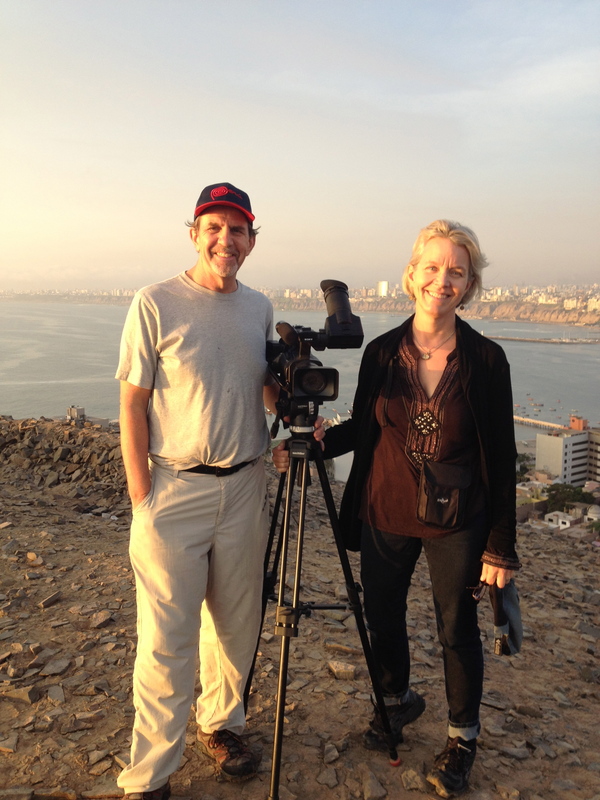 I create independent documentary films with my husband, Rustin Thompson. This unpaid work gets all mixed in, every day, with our paying work. 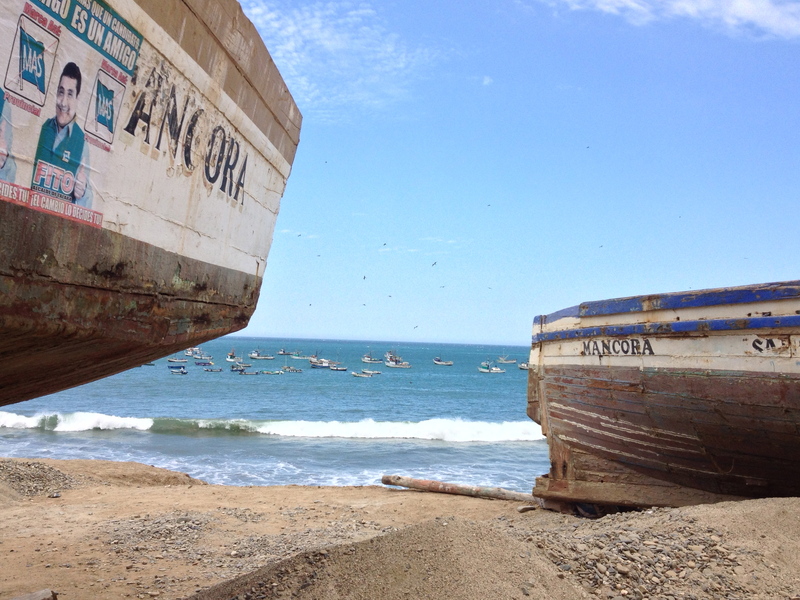 The borders are porous and the benefits flow both ways. We bring more creative energy to the work we do for our clients—nearly all of them hard-working nonprofits in the Puget Sound area—who in turn inspire us to be creative. Meanwhile, there’s cooking, housework, family time, all going into the daily mix. The dark side of this is the much-bemoaned syndrome of always being chained—either by necessity or choice—to your work via the phone in your pocket. The bright side is when it can all blend together in the best ways. During the Depression, Robert Frost wrote a poem called “Two Tramps in Mud Time,” about two hungry hobos who showed up in his New England yard just as he was getting ready to split wood—a task he loved and which, he implies in the poem, inspired him creatively. But he knew the tramps needed the work, and he knew he would offer it. “My right might be love but theirs was need,” Frost wrote. As I watch my own young adult children launch their working lives, my hope for them is that they will be able to meet their needs doing work they love. It’s a good goal. But as it has been for us, it might have to be a blend: some work done for love, some for need, some for love and need.